There are those in the world that think that tabletop games and video games are at odds with each other; they think that the xboxes and PS3s of this world are driving people away from the hobby. There are those that go further and reckon that making a digital version of their beloved board or card game will mean people won’t buy a physical copy. Days of Wonder and Ticket to Ride have proved that, for them at least, the sale of iOS versions of their board games has actually increased sales of the physical product. This isn’t always the case, and in the case of Ascension: Chronicle of the Godslayer an iOS port of Gary Games’ deckbuilding game means I will probably never buy the tiny bits of card. I’m not saying Ascension is a bad game, no in fact I’m saying Ascension is a brilliant game, or more importantly a brilliant iOS game. The issue here is that Ascension works so well as a portable game that I have no interest in playing the physical version. It runs smoothly and fits the medium in such a way that sitting across from a real person and staring them straight in the eye doesn’t hold the appeal it should. Part of this is due to Ascension’s one sided nature; it is a deck builder and as with most games of the genre the aim is to construct your deck of cards on the fly to score points quicker than your opponent. Deck building games are often accused of being nothing more than ‘multiplayer solitaire’ and it’s one of the issues I have with the daddy of the genre; Dominion, it’s also why Ascension as a videogame works so well. The lack of direct interaction between you and your opponent means you can take your turn free of interruptions and external complications. This kind of simplicity can make a table top game feel dry but suits a video game’s more personal nature. This uninterrupted player turn also means that the asynchronous multiplayer works a charm and you can have many games on the go at once. In Ascension, you are battling the avatar of the fallen god, but building up combat power and currency to score victory points, some of those points, gained from defeating baddies’ are on display whereas the rest are kept secret. Deckbuilders are a genre that is getting a little stale and Ascension’s strength in the field is also its greatest weakness. Whereas other games will have different decks of cards to buy from, Ascension has a single random deck that creates the six cards you can purchase or defeat. This means that the list of available cards changes each turn. It keeps the game varied and attention-grabbing and means that you can’t plan too far ahead; you have to keep your deck agile as you don’t know what’s going to be the next card drawn. The issue here is that, unless you’re going to buy the expansions, you’re always dealing with one deck of cards. After a few games you start to see the same cards over and over; what Ascension gains from having a deck that changes from turn to turn means that it loses the variation from game to game. However, it’s this round to round variation that makes Ascension so much fun to play. You can’t plan ahead too far ahead and you are constantly trying to juggle your deck to face the current situation. Do you specialise on combat, only for no monsters to appear? Do you specialise in buying the high victory point cards but get crippled by a pool of cards full of gribbly monsters? Or do you go the jack of all trades, master of none approach and hope things come up your way? It’s these decisions that are important while also keeping in mind what your opponent’s deck is trying to do. Your choices change every turn. 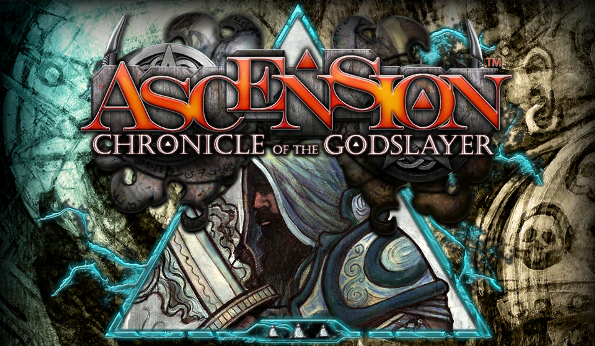 Ascension is a video game version oozes a sense of style that mere cards can’t convey. Each card in the game has been lovingly recreated with its distinctive dreamscape artwork. I know people have criticisms of this art but I personally believe it is both unique and stylish. As with Elder Sign, it’s the extra dimension of the soundtrack that really augments the character of Ascension. The score is one of Playdek’s best to date, wonderfully fitting the art style without having that horrible jarring and repetitious nature that so many board game ports have you reaching for the mute button. Both art and music combine to give Ascension a mood that many ports in this genre miss out on. Of course there's expansions and they're all worth it. So why has this stopped me from buying the physical version? Well it’s because everything is so well done. Combined with Ascension’s one sided nature it has made me thoroughly enjoy the game but has suppressed the need to get this onto a table top. As a comparison, Playdek’s other big deck building conversion; Nightfall is a game that makes me want to try out my strategies against a real people even more and this is because of the direct player interaction. I’m not saying it makes Ascension a bad game, in fact it adds to it in a way that only a smartphone game can, transforming an hour long tabletop game into a few minutes of delightful tapping. Ascension: Chronicle of the Godslayer on iOS does everything right, which is why the digital version will trump the physical version for me. Everything just works and Playdek’s version of the game takes all the faff out; no shuffling, no setting up, and no fat crisp guzzler getting his greasy fingers on your cards.